CHICAGO (AP) — Making a rare visit to the postseason, the Washington Wizards made it look rather easy, dispatching the Bulls in the opening round. Now, they're moving on. That's right, the Wizards are moving on. 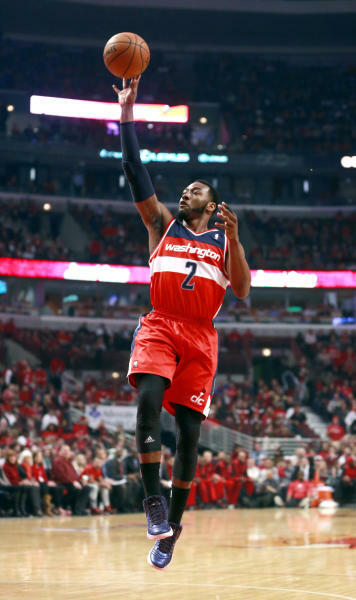 John Wall finished with 24 points, Nene scored 20, and Washington beat Chicago 75-69 Tuesday night to clinch its first-round series in five games. Bradley Beal scored 17 points, and the fifth-seeded Wizards advanced in the postseason for just the third time since the 1970s. They will meet Indiana or Atlanta in the Eastern Conference semifinals. It's a huge step for a franchise that hadn't been to the postseason since 2008, but with Wall and Beal leading the way, they won 44 games during the regular season. "This is my second year, and for us to make the playoffs and win a tough series against a great team we just played against means a lot. At the same time, it's a humbling experience because a lot of people doubted us. Now, we know what we're capable of doing." The Wizards turned a halftime tie into a nine-point lead heading into the fourth quarter and hung on down the stretch. 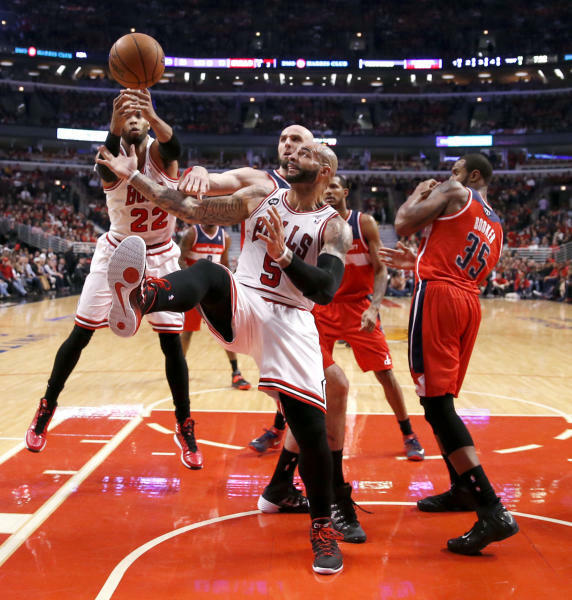 "It is real disappointing," the Bulls' Taj Gibson said. "We put so much work into the season, came out of countless holes." Chicago's comeback chances took a big hit early in the final quarter when Gibson crumbled to the court clutching his left ankle after he tried to block a layup by Wall with the Wizards up by six points. He had to be helped off the court and did not return. The Bulls got within three in the closing minutes but couldn't grab rebounds when they needed them, particularly after D.J. Augustin hit two free throws to make it 72-69 with 2:18 left. The Wizards grabbed three offensive rebounds while whittling more than a minute off the clock before Beal threw the ball away with a minute left in the game. Carlos Boozer missed on a drive, but the Bulls couldn't convert after a shot-clock violation by Washington with 22.4 seconds left. Chicago's Jimmy Butler missed on a layup off the inbounds, and the Wizards caught a break after Andre Miller missed two free throws. Nene tracked down the loose ball and got it to Beal. He was fouled and hit the first free throw to make it 73-69 with 14.6 seconds left before missing the second. Then Nene got another rebound, and that led to two free throws by Wall with 7.8 seconds remaining. Whether knocking down jumpers or scoring inside, Nene was back to wreaking havoc after serving a one-game suspension for grabbing Butler's head. He hit 10 of 17 shots and grabbed seven rebounds. Wall also had seven boards and hit 9 of 11 free throws. Marcin Gortat grabbed 13 rebounds, and the Wizards did something they've rarely done the past three-and-a-half decades — they moved on. The playoffs have mostly been one-and-done affairs for them since they lost the 1979 finals to Seattle, with a few exceptions. They knocked off New Jersey 2-0 in the first round in 1982 and took out Chicago in six games in 2005. In this series, they showed a resolve and killer instinct that wasn't always there in the regular season. "The main thing is to focus in and knowing what this team is capable of," Wall said. "I just give a lot of credit to my teammates and the coaching staff and the great game plan and making adjustments and committing ourselves to play on every given night." For the Bulls, Butler and Kirk Hinrich scored 16 points each and Gibson had 12. Joakim Noah, whose left knee has bothered him the past few months, added 18 rebounds and seven assists. Boozer added 10 points and nine rebounds in what might have been his final appearance for Chicago. But the Bulls were just 25 of 75 from the field in this series. The Wizards also outscored them 20-11 in the third quarter to turn a 41-41 halftime tie into a 61-52 edge going into the fourth. "I am proud of this team," Noah said. "I am proud of the way we competed all year. We dealt with a lot. Whenever a season is over it is always tough." 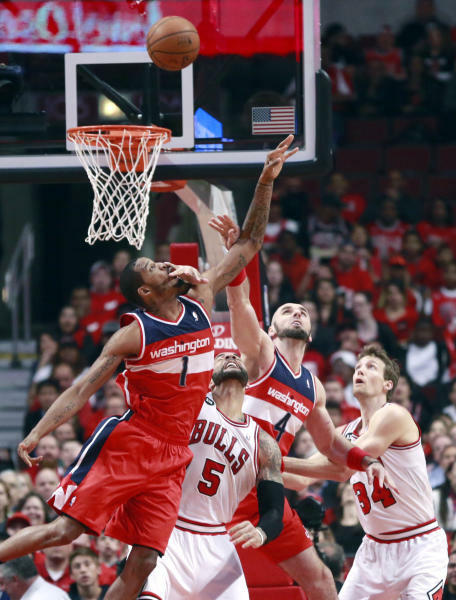 NOTES: The Wizards outrebounded the Bulls 49-43 overall and 15-8 in the fourth quarter. ... Nene declined to comment about his suspension at the Wizards' shootaround, saying, "I don't want to talk about that." ... Gibson on his injury: "Real painful. I got to see what they (the medical staff) say tomorrow."